There’s a bit of a theme in my recent blogs telling the stories of the precious dogs in my life – their incredible ability to be great life teachers. 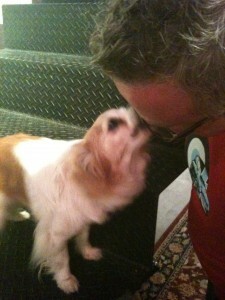 I credit Daisy, my beautiful little Papillon cross, with teaching me so much about animal behaviour. She played a crucial part in helping me achieve my qualifications in dog training. About 15 years ago I picked out Daisy from a local dog shelter for the sister of my partner at the time. Despite the sister’s good intentions of wanting to rescue a pet, her inexperience with dogs made it a bit overwhelming for her to keep six month old Daisy. So within a couple of weeks, this mini package of tan and white sweetness became a fully fledged member of the family, joining Max and Oscar. Daisy knows how to turn on the alluring charm. She has a particular fondness for eliciting pats from unsuspecting guests, particularly men. 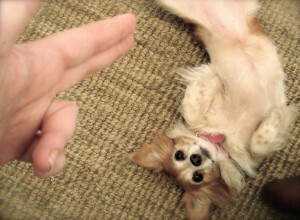 But despite this apparent boldness, Daisy was also subject to bouts of submissive fear. Sometimes all it would take was a seemingly innocuous look her way and she would cower and pee. It was not a significant problem, so we went on with life accepting that it was just a quirk we would need to live with..until she was about eight years old. It was at this time that I decided to learn more about dog behaviour and training and enrolled in a local dog training course. The course required participants to have access to a dog they could use to apply the theory. By then, Daisy’s fellow fur-sibling Max had passed away and Oscar had recently suffered debilitating paralysis. So it was up to Daisy to take one for the team. I had reservations about using her given her unpredictable bouts of fear, but upon reflection, it was the best decision I could have made. I had reservations about using her (in my training course) given her unpredictable bouts of fear, but upon reflection, it was the best decision I could have made. Over the year of completing the course, Daisy and I spent hours together practising our demonstration trick, which was a key part of my assessment. I intended to impress my course colleagues with a bedazzling display of Daisy walking across a ladder – my hopes shattered after a week when the ladder contraption I had made gave way when Daisy stepped on it. Any sight of that ladder from that point forward sent her cowering. 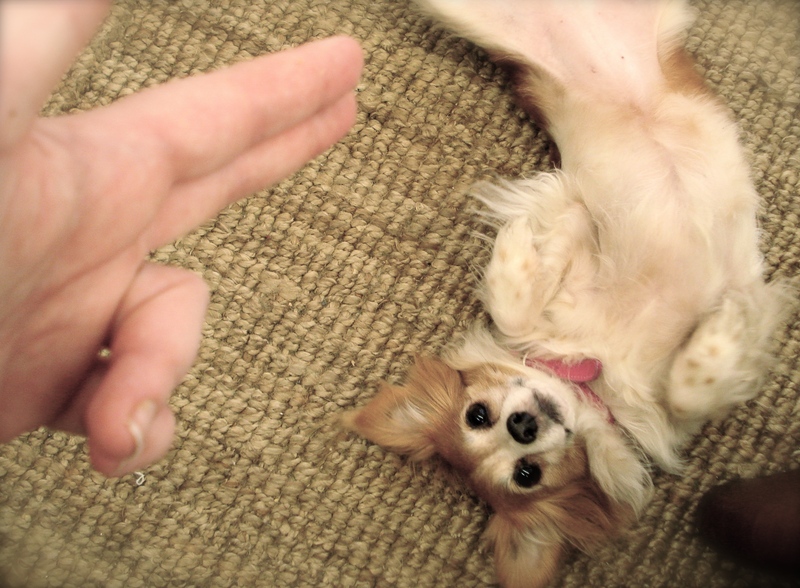 We promptly changed our trick to a “play dead” sequence and never looked back. Over that year I noticed Daisy’s confidence had grown exponentially. After all these years, I realised that all I really needed to do was engage more with this lovely complex dog, learn about how she viewed the world, and increase her sense of control through positively reinforcing and encouraging her. Just a few simple changes in the way I cared for her could have made all those previous years of fearful triggers far less intimidating for her. How did she perform on the day of our assessment? I had great trepidation given the pouring rain and untested environment, but she delivered her “bang-bang-play-dead-trick” with great aplomb and we passed. But the biggest surprise on the day was an unprompted one. Without a cue, lure or hint of reward, Daisy took it upon herself to climb onto a fellow class mate’s dog trick prop – the so-called dreaded ladder – and trot across matter-of-factly with the confidence of a showgirl. Dogs never cease to amaze me! 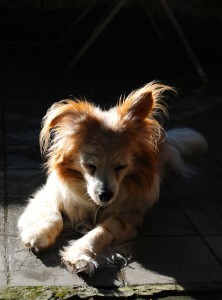 We may worry that rescue dogs, particular more mature ones, will come loaded with insurmountable issues. Sometimes they can. But Daisy is a great example that with a bit of effort, persistence and love, those issues be managed regardless of the dog’s age. Daisy taught me the importance of understanding the way animals think, learn and respond to the world and it is all our responsibility to build our awareness of this if we want to be fair and loving guardians to them. She also taught me that investing time to engage with our pets in positive ways not only helps them lead content and balanced lives, but helps us build unimaginably rewarding bonds with them. We may worry that rescue dogs, particular more mature ones, will come loaded with insurmountable issues. Sometimes they can. But Daisy is a great example that with a bit of effort, persistence and love, those issues be managed regardless of the dog’s age. Most importantly, the experience alone will definitely teach you so much more about yourself and the wonder of animals than you could imagine.